So, you’re here to know the best apps for writing poetry, that’s cool. We’ll get to that part shortly. Firstly, poetry is a medium used to express how you feel through the use of styles and rhythms in a poem. Everyone is required to have a particular level of knowledge and skill before trying to do poetry, you also have to be sincere about your topic. So a person who writes a poem or a person who is into poetry is called a poet. This, however, is not a new thing for you. Well, this topic may be favorable to a poet, because it will make sense when a poet is able to write with his or her smartphone anywhere and anytime. In order to make that happen, some Android developers decided to come up with the best poetry writing apps for Android. So, below I’ll be listing some best apps for writing poetry handpicked by me. The first app on my list is called mirakee. Mirakee is like social media for poets. Its all about poetry all time in there, all you do is just log in, publish your written poems, and everyone gives you a review. This app has a simple user interface and features awesome stuff like cool design tools and lots more. It also helps your poems to be seen on the Google search engines too. There are some in-app purchases, that are strictly for donations. This is actually one of the best poetry writing apps for Android. This app is created for poets to write poems, with ease. It helps you search for the right words to use, synonyms, and words with the same sounds etc. It has a friendly user interface in case you wish to use themes on it, and also tune the UI to your taste. This app is one of the best poetry writing apps for android because it can serve as a dictionary and also serve as an assistant for poets. It’s free to use with no in-app purchases. This app has lots of offline tools that can help every poet in writing a nice poem. It features a rhyming dictionary by Carnegie Mellon University pronunciation dictionary, a WordNet dictionary and a screen where you can enter your poem text, have it read aloud back to you by the device’s text-to-speech engine, and see the word/character count. The dictionaries in this app do not require internet connections to be used. If you’re a poet and you don’t have this Android app, then your really missing. This app is packed up with histories and poems of all famous poets you can mention. You can read three poems and learn a lot about them, the mistake they made and how they write their kind of poems. You can also get the latest poem writing by them by just shaking your smartphone. This app is free to use and requires a data connection. I listed this app as one of the best poetry writing apps for android because as a poet you need to have a role model and also know much about him/her. Rhyme time is an amazing and wonderful app for poetry writing. It just like a dictionary that gives you rhyming words to use in creating a nice and sweet poem. Their meaning and pronunciations are also included in the app. This app should be found in every poet’s android device. Poem publisher is not just an app for writing poems but it’s also a publisher. You can get to write poems and publish them, and they’ll get reviews from people who use the app too. This app accepts all types of poetry styles and also lets you comment on other people’s work. You can also publish your works into different categories, connect with your favorite poets and also edit your creations too. This app is the best and safe place to read and publish poems. Without thinking a lot about judgments, you can post your poems based on various topics like love poems, couples poems etc. When you get your stuff published you will also get notified of when your post gets liked or someone comments on them. You can also edit the poems anytime you wish to. Most times it happens that you come up with ideas and words but confused on how to put them down in the right way. So to help you do that, the poem writer is the key I want to introduce to you. This app just works like magic, all you have to do is simply enter your topic and the Poem Writer will automatically generate a new poem for you which you can save and share with friends and family. Every poet finds it interesting using this app to write poems because it provides you with the basic information about over 300 poets and 3700+ poems. You can also learn and grab new poem writing styles from every great poet in this app. It also helps in increasing your thinking and reading ability. This app is able to function online and offline by bookmarking your favorite poems. It has a friendly UI which looks sweet. This app is one of the most wanted best poetry writing apps for android because it gives you the opportunity to write a single line on any topic and the 2 other strange people will add 2 lines to make a 3 line perfect poem. It is also one of the best ways to meet up with other poets like you and get ideas from them too. This app is worth everything, you should give it a try. Creative writing is an android app that helps in any form of writing which is written with the creativity of the mind. Examples: fiction writing, poetry writing, creative nonfiction writing and more. The purpose is to express something, whether it be feelings, thoughts, or emotions through poems and is much easier to use. If you are a beginner in the game of writing different types, then this app will nurture you well. This app is critically for creative writers who wish to write in an extraordinary manner. It is perfect for writing books, novels, and poems. The clean typing interface aids a lot to that too. This app is very essential to all writer and will help you unleash your creativity. You can backup your works on cloud and also get to edit them whenever you wish to. Research making is quite easy due to the dictionary that is built-in in this app. This app has a free version and a pro version which is not too costly. We have finally gotten to the end of this sweet topic. 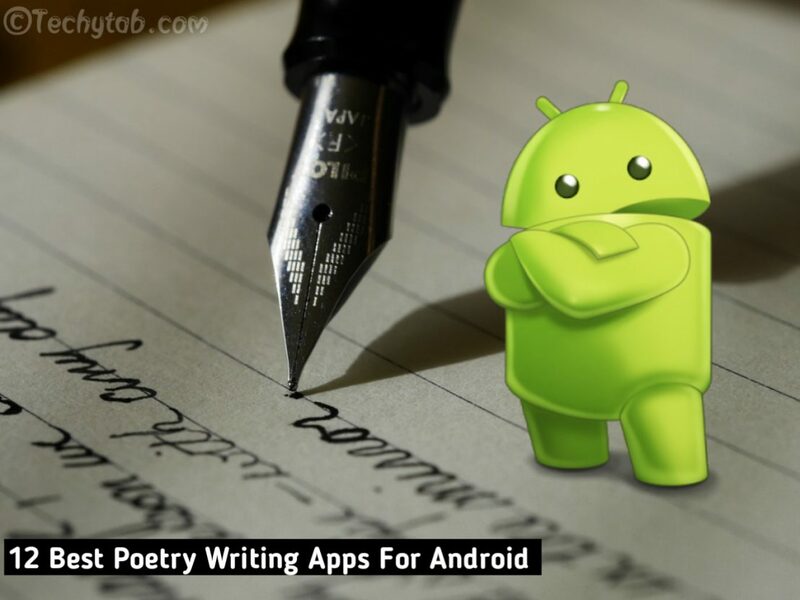 Do you like to get the benefit from the above android apps or writing poetry? Which one is up to your taste? Is there any of your favorite poetry writing apps for android that we missed? Kindly use the comment box below and we’ll do a review and add it to our list. Thanks for stopping by and reading our article on the best apps for writing poetry.